Back in high school when I’d heard a song I liked, I’d find a friend who had the album and take a cassette tape over to his house and copy it. I’d made dozens of mix tapes that included all my favorite songs. As a last resort, I’d even record a song off the radio if I couldn’t locate a friend with the album. An occasional band like Def Leppard (Pyromania rocked! I wore out one album and two cassette tapes) would come along and I’d break down and buy the album or cassette tape. But, for the most part, I didn’t buy a lot of the music I listened to. When CDs came along I was in college and still without a lot of money to purchase music. I seldom bought new CDs but I’d hit up Gray Whale used CD exchange until I found what I was looking for, usually to the tune of eight bucks or less. Over the years, I built up a collection of hundreds of CDs in this manner. Even when I had a full time job and could afford new CDs, I’d hit the used CD shops of downtown Seattle to pad my collection. But times have changed. It’s been years since I purchased a used CD. I still buy the occasional new CD but that’s rare and only for bands I know I will enjoy like Alison Krauss or Tracy Chapman. Favorite Artists/Groups: Buy CD from Target, Fred Meyer, Wal-Mart or Amazon. Individual Song: Buy if available from Amazon MP3 Store. If not available I’ll check iTunes and buy it there and then use Tunebite to remove the DRM and convert to MP3. Amazon’s MP3 Store makes it easy to locate, preview and purchase DRM-free tunes. Not Available at Amazon MP3 Store or iTunes: I will use MiniNova to locate the song and uTorrent to download it. I do this for singles that a band releases before the album/CD is available or bootlegs or live tracks that are not available anywhere else. An example of this would be the song, “She’s a Mystery to Me” from U2 which is still hard to find today. It pops up now and then on the torrent sites. See here for YouTube version of this killer tune. Playback for best possible sound quality: Q-Player + iZotope DSP plugin. To my ears it makes everything else sound like crap although not the most user friendly or feature rich option. But if you want your music to sound its best, look no further. Playback for Podcasts, Audio books and everyday music – iTunes + Volume Logic DSP plugin. Most people find this solution easy to use and pretty much the only choice if you own an iPod. If you’re daring you can give open source Songbird a try. I’m running it at work and like it quite a bit. 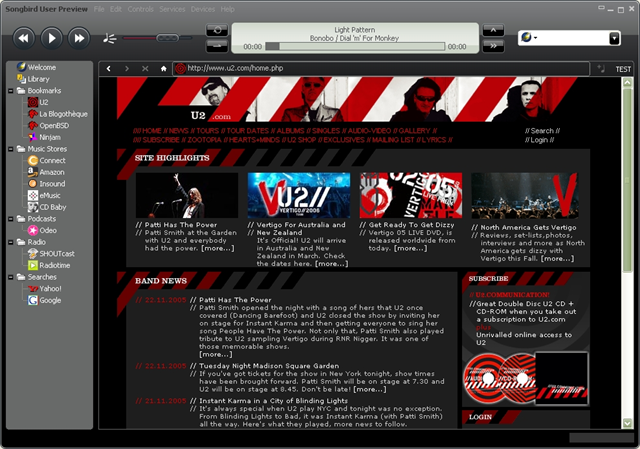 Songbird is based on the Mozilla platform and is a solid competitor to the ubiquitous iTunes. For Quick Ripping I use CDex. For the best possible sounding rips I use Exact Audio Copy which is slower but provides the best possible rip. I wrote about EAC and CDex a while back here. Tagging: If you purchase songs from iTunes or Amazon MP3 Store, they come properly tagged which is nice. It’s hit or miss on torrent sites as some will come fully tagged while others are a mess. If you have a large collection of music that needs tagging I highly recommend grabbing a dedicated tool for the job like Dr. Tag Plus. It’s $35 price tag is a bargain in such cases. It also comes with advanced tagging features you won’t find on the free programs. If you have a large batch of mp3 files that require renaming, just grab this program and save yourself hours of hassle. The feature set on Dr. Tag Plus can be a bit overwhelming at first, but it’s a huge time saver if you have advanced tagging needs. I’ve used dozens of other programs over the years as I’ve moved my CD collection over to digital format. I’m interested to hear what programs you use to manage your music collection as I’m sure I’ve overlooked many worthy products. This is an excellent entry on MUSIC. I am a music fanatic and I buy used CDs. independent artists. I support them! Time Magazine rated it one of the top websites.